You can try mixing oil and water by shaking them vigorously in a bottle, but before you know it, they’ve separated and the lighter oil is floating on top of the heavier water. This is because water is polar – meaning one end is more negatively charged and one end is more positively charged – while oil is non-polar without an electrical charge. In chemistry, like dissolves like, which is to say that two or more polar ingredients can mix together, such as water and alcohol or water and glycerin, and two or more non-polar things can mix together, like olive oil and shea butter or using an essential oil in a lotion bar. But to get these lovely polar and non-polar ingredients to come together in a lotion, we need an ingredient that loves them both to come to our rescue. Save us, emulsifiers! 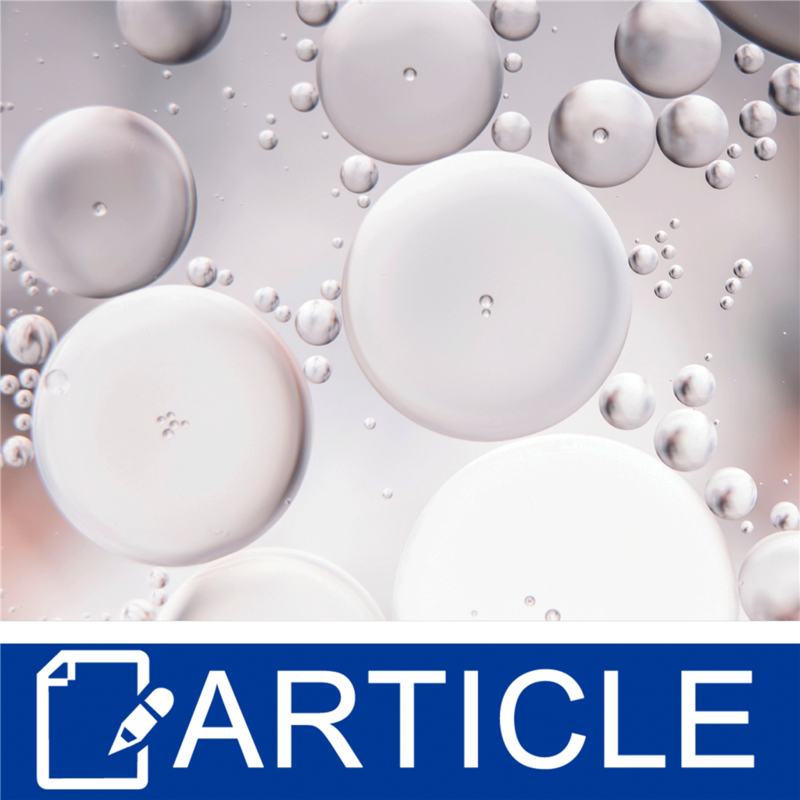 An emulsifier is an ingredient that breaks the surface tension between the oil and water – a tension so great these two liquids don’t want to mix – and brings them together. The water attaches to the hydrophilic or water loving head of the emulsifier, while the oil attaches to the lipophilic or fat loving tail. If the oil is surrounded by the emulsifier to create a ball or micelle that floats in a sea of water, this is an oil-in-water lotion because the larger phase is the water. If the water was in the micelle, it would be a water-in-oil recipe because the oil is the larger phase. Almost all of the emulsions we make as homecrafters are oil-in-water products, which include lotions, creams, hair conditioners, and facial moisturizers. The less common water-in-oil lotions include cold cream or Galen’s cream. All emulsions are unstable. They don't want to remain emulsified because it requires too much energy, so an epic lotion separation is almost guaranteed at some point in a lotion’s lifetime. Our goal, then, is to use all the methods and ingredients we have at our disposal to make a product so stable it’ll be passed down as a family heirloom. (Warning: The rancidity of a generations old lotion has a smell radius of at least a block! Open at your peril!) How can we do that? We use a great emulsifier, heat our ingredients, and mix well when we bring the oil, water, and emulsifier together. The easiest way to use an emulsifier in your lotion is to choose an all-in-one emulsifying system like Polawax, emulsifying wax, Incroquat BTMS-50, Ritamulse SCG, Lotionpro 165, Montanov 68, Simulgreen 18-2, Aristoflex AVC, and Olivem 1000 to name a few. (The slightly harder way is to create your own emulsifier using the HLB system.) If you aren’t sure what you’re buying is an all-in-one emulsifier, ask your supplier for help. Before you start, ensure you know all the uses and restrictions of your chosen emulsifier by checking with your supplier or reading the data sheet. Some require stabilizers like fatty alcohols, fatty acids, or gums, while others require a specific mixing style, like the use of a stick blender or propeller blade. Some can’t work with cationic ingredients, like Ritamulse SCG, while others can’t work with electrolytes or proteins, like Aristoflex AVC. Check the types of oil soluble ingredients you can use as some only work well with vegetable and seed oils, like Sucragel AOF, while others work especially well with silicones, like Incroquat BTMS-50. And always check how much oil your emulsifier can handle. Some are great at up to 50% oils, while others, like Ritamulse SCG, can’t go over 25%. Ensure you are using enough to emulsify all the oil soluble ingredients including oils, butters, esters, fatty alcohols, fatty acids, silicones, waxes, and essential or fragrance oils. Polawax is used at 25% of the oil phase. If you had a 24% oil phase, you’d add 6%; if you had a 32% oil phase, you’d add 8%. For emulsifying wax NF, calculate the Polawax amount, then add 1% more. For Lotionpro 165, the suggested usage is 2.5% to 5% for 20% to 30% oils, while Montanov 68 needs 1% to 5% for up to 25% oils. Aristoflex AVC is used at 1% for up to 5% oils and silicones, but might go as high as 10%. There is no hard or fast rule you can follow for all emulsifiers. Once you’ve chosen your emulsifier and recipe, don’t forget to heat your ingredients and mix well to create a stable product. Generally, we heat our ingredients to 70°C or 158°F, then hold them for 20 minutes to ensure all ingredients have melted well. We pour the oil and water into a container, then mix really well with a hand mixer or stick blender. When the lotion reaches 45°C/113°F, we add the cool down phase, and bottle when it reaches room temperature. Ta da! A fabulous lotion is born! If you’re a newbie lotion maker, I recommend Polawax or Incroquat BTMS-50 as they’re super easy to use and pretty forgiving of hand slips or miscalculations. Or, if you’re interested in making very light lotions and facial moisturizers, consider Aristoflex AVC, which can be made cold! Emulsified products like lotions and hair conditioners are great fun to make and can be surprisingly simple when you have the right emulsifier. "What is the best way to blend components? A stick blender seems to be the messy route. Should a stand mixer be used? " Staff Answer We actually prefer stick blenders when emulsifying. They work great and it does not take long to get great results. A hand mixer also works great but if you have a large batch you can certainly use a stand mixer. Just be sure to scrape the bottom of the bowl to be sure everything gets well blended. "I would like to make a body bar with Magnesium water incorporated. What would be the ratio of water and emulsifier?" Staff Answer It would depend on which emulsifier you use. Please check the directions under each one to see how much is recommended.